Searching for information about this duo turned up several definitions for their combined moniker, including the nineteenth letter of the Greek alphabet and a bowed string instrument from India. Neither of which seems to have much to do with the disc at hand. At least not overtly. I suspect the name comes from a combination of the letters of the two members names. 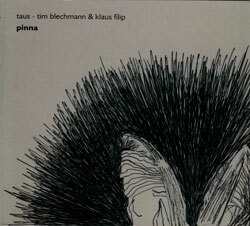 Tim Blechmann and Klaus Filip both play laptops on this live recording from 2010. At first it sounds like a field recording of a largish room; a shuffle here, a muffled cough there suspended in a very quiet tone, maybe a far-off generator or other building machinery. Gradually a higher pitch enters and swells, now two pitches entwine, like a braid, a thick chord. Rumblings and a bit more footfall, a conjured thunder. Perhaps a bit of traffic noise from outside the venue. It's difficult to tell what's being "played" and what's just happening, and therein lies the charm. This could easily be a recording of someone walking around inside a large industrial building, somewhere between the walls where all the inside and outside sounds are muffled and combined. Ever so gradually things start to heat up a bit, low and high pitches joined by a sibilant hissing with a ruffled edge, and those background bangs and whiffs pop in every so often. The hiss grows up and the bass end drops out, replaced by a series of tones that hover in the foreground and then shimmer back and forth, each new tone beginning louder and then fading back into the general chord-age. It all makes perfect sense and is a good example of contemporary improvised music. EAI? Maybe. Ears? Most definitely.